Pomological watercolors. That’s what the handout says. I picked it up at the National Agricultural Library table at the FLICC Job Fair this summer. 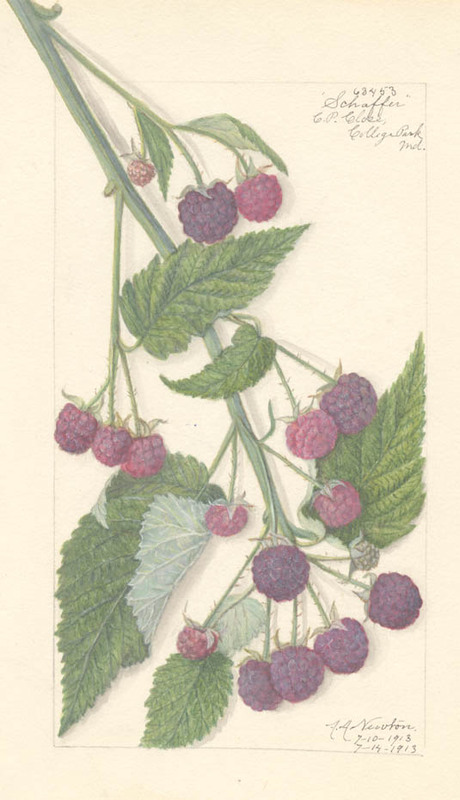 In the late 19th & early 20th centuries, the newly formed Pomology Division of the USDA hired artists to help document fruits bearing species from the American Flora. Now a collection of those images is available to you and me, for free, online. They’re incredibly gorgeous. Also, bonus, I belieeeeve American intellectual property law does not lock down these images. They’re in the public domain, having been created prior to 1923. Nice, right? BTW, the job fair was fantastic and you should try to go if you’re interested in Federal Libraries, Archives, etc. In the mean time, just join the Careers in Federal Libraries Google Group. This entry was posted in Uncategorized on November 9, 2009 by Jason. oh wow. so pretty. i love things like this–drawings in old travel journals, biology before photography. thanks for posting it. these are gorgeous! thanks for posting! thanks wendy! your blog looks awesome; a really ambitious and inspiring undertaking! The McLean Library at the PA Horticultural Society has this book. Its really beautiful! Also, the library at The Academy of Natural Sciences has an elephant folio of Audubon’s Birds of America. They turn the page every Friday afternoon. Its quite an event, and open to the public!